Do you see a room with a cube in the corner? 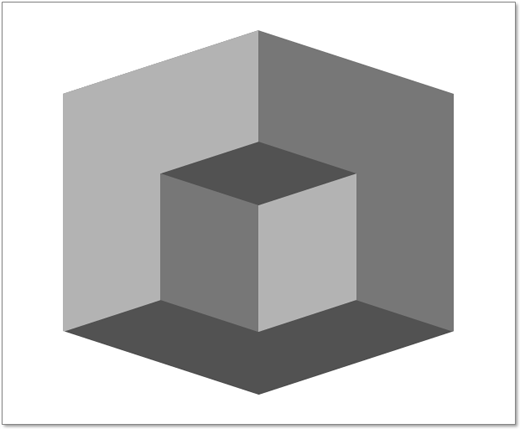 Or do you see a cube with its bottom-front corner missing? How fast can you switch back and forth? You might think this can be done with a 3d chart. Nope. To make this I used the same technique of layering series in an Area chart that I used to make the 42 flags in the Eurovision 2009 project and the American flag in the Flag Project. All of the data for this chart is held as array constants within the chart series, and so no worksheet cells or named formulas are used. I'll have another Excel based optical illusion next Friday. The file should work in all versions of Excel. Thanks for this blog-- this is the first time I've ever seen anything attractive come out of excel. I'm pretty novice with excel, but I learn by reverse-engineering, so I thought I'd start by reproducing one of your simpler-looking diagrams. I downloaded your excel spreadsheet and found-- nothing. Just the same image I see here, with a link back to the blog. How does it work? who knows? How do I get to look 'under the hood'? The first thing you need to do is UNPROTECT the worksheet. This is done differently in different versions of Excel, but there is no password, so uprotecting the sheet is as simple as clicking on the menu command. Once that is done, just click on different areas of the chart and look at Excel's formula bar when you do. You will see the various data that make up each piece of the image. The pieces are layered on top of each other to produce the final picture. or do you see two cubes? This page contains a single entry by Daniel Ferry published on March 26, 2010 10:13 PM. Animated Stacked Chart was the previous entry in this blog. Excel Lissajous Curve Explorer is the next entry in this blog.